MDC leader Nelson Chamisa says he is ready to step down if he loses the party's internal polls scheduled for May this year, the Daily News on Sunday can report. Chamisa – who assumed the reins of the country's largest opposition party in February last year, albeit under controversial circumstances – faces a challenge from the MDC's secretary-general, Douglas Mwonzora. Mwonzora, who beat Chamisa during the 2014 congress for the post of secretary-general, has previously kept his cards close to his chest. It was only last month that he openly declared his ambition if nominated. Elias Mudzuri, one of the MDC's three vice presidents, is still weighing his options and may also throw his hat into the ring. In an exclusive interview with the Daily News on Sunday yesterday, the MDC leader said he will respect any outcome at the upcoming polls, but underscored the fact that safeguards would be put in place for the conduct of free and fair elections. "They can never be democracy without democrats; I am a democrat – whoever comes out the winner in the process, I will also be a winner and I am duty bound by my beliefs to support the outcome," he said. "In any electoral processes in a democratic organisation, democracy is always the winner. And we are going to have an independent commission to run the election so that the process is not contaminated by internal pollutants," added Chamisa. In the July 30, 2018 presidential polls won by President Emmerson Mnangagwa, Chamisa rejected the outcome of the elections on account of the electoral processes, which the MDC argued were designed to favour Zanu-PF party. Chamisa took his case to the Constitutional Court which dismissed his application with costs, while upholding Mnangagwa's razor-thin victory. Regardless, the MDC leader has vehemently refused to recognise Mnangagwa saying the Zanu-PF leader owes his presidency to an illegitimate process. Chamisa is hopeful that an independent commission would produce internal polls that are not "contaminated by internal pollutants," in a bid to avoid disputes. The 41-year-old politician warned his would-be challengers for the party's presidency to hold their horses and quit campaigning for posts before nominations. "In our party, leaders don't determine their fate. We have over a million members, and delegates who will come to the congress and those are the people who are going to choose their leaders," said Chamisa. "We do not self-deploy; we are deployed by the people. The nominations are going to be determined in the provinces – there is no way anybody is going to say I want to be this." Even though Mwonzora has expressed his desire to challenge for the top post in the MDC, he also alluded to party processes which he said must be followed ahead of the elective congress. He said: "I will be giving you a statement regarding to what I will be standing for. There are key processes that must happen first and these include the nomination process. Within the MDC set-up, people are nominated by the structures; I want to emphasise I am a full member with full rights including the right to contest any position." Mwonzora was also quoted previously laying down the rule to be followed. "There are processes that have to be followed, we must have branch congresses, then ward, district, provincial congresses and after that the provincial assemblies will do nominations, it is at that time that we will know if we have been nominated," Mwonzora was quoted saying. Mwonzora told the Daily News recently that he is aware of a smear campaign targeting him but that will not deter him to contest in any position "because the opposition now requires someone with the right temperament" and who understands democracy". "We are also aware of the smear campaigns that are going on but that is expected considering that we are now going to the congress," said Mwonzora. But in a thinly veiled attack on those who have been beating war drums ahead of the elective congress, the first since the death of the party founding president Morgan Tsvangirai, Chamisa said those with unbridled ambition are failing to appreciate the heart and soul of the MDC. 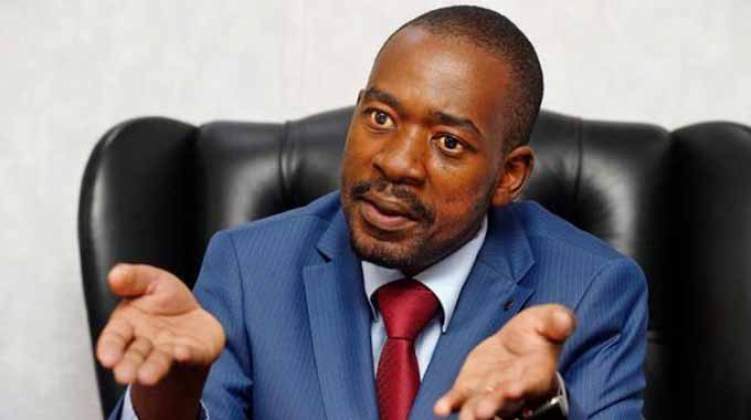 Asked about his relationship with Mwonzora who recently declared that he has a right to contest in any position, Chamisa said the office of the MDC presidency works closely with that of the secretary-general to enhance democracy not only in the party but also in the country. "I have a very good relationship with Mudzuri, (vice president Welshman) Ncube, (vice chairperson Tendai) Biti and Mwonzora. As far as I am concerned, the relationship (with the MDC leadership) is of people in a team. "In our party, we don't crucify ambition. In our party, we don't persecute desire. In our party, we celebrate diversity, but it has to be anchored on leaders being chosen and not individuals indicating where they want to be. "It should be about the organisation; people have to choose you, you don't deploy yourself, you don't say I want to be there – those are not attributes of a leader. People must be ready to be nominated but not to self-nominate; you are nominated first before you pronounce yourself. In our party, leadership is in the doing rather than in the being…that is how we were taught by our president the late Morgan Tsvangirai…," said Chamisa.